The place was North Clare in Ireland in June 2004 and the angler was Sea Angler magazine's contributing editor Alan Yates. Roll on two years and Alan was back, accompanied by some of his angling pals, to do it all again. 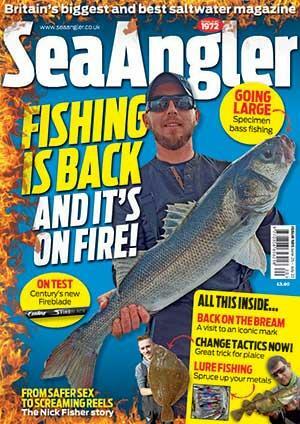 The Sea Angler visit in June coincided with the start of the first real hot weather of the year. Clear blue sky, little wind and calm seas boosted the Irish bank holiday atmosphere, so hopes were high on the 75-minute car journey from our base at Kilkee to Alan's west coast hot spot. Destination was The Burren, a unique limestone landscape of north-west Clare. Overlooking the Aran Islands and Galway Bay, it covers 300 square kilometres and is enclosed by a circle of villages, with Lisdoonvarna to the south and Ballyvaughan in the north. All along this coast are rock platforms giving access to deep, fish-filled waters. 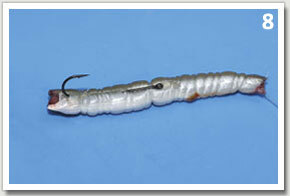 Very popular with anglers, it is rough close to the shore but a modest cast puts your bait onto sand. Alan's plan was to stop at Ballyreen, just before Black Head. This was his fabled ground and also one of only two places in County Clare where sharks and tope have been landed from the shore. The sea cliffs in this area are also popular with climbers and tourists, but parking isn't too difficult alongside the road. Besides Alan and his fishing pal John Wells, our four cars contained Tony Anderson, of tackle firm Greys; England shore team selector Chris Clark; Simon Barber, owner of Wessex Angling Centre at Poole and Norman Dunlop, of Ireland's Central Fisheries Board. After parking the cars, the group were soon making their way at the double over about 100 yards of grass and rock before getting down to the ledges. Care is required when clambering over the rocks and access to the ledges can involve some climbing. Peg numbers have been painted on the rocks up to Black Head, so it's easy to remember where you've fished. With a high tide in the afternoon, they would be fishing the flood. You're unlikely to be fishing alone on these deep water marks in summer because mackerel fishing is very popular with the locals. However, there is plenty of room for everyone. Besides the feathering, you can fish on the bottom or try float fishing and spinning. Bottom fishing onto the mixed ground or sand will produce various rays, including stingers, in calm weather, plus dogfish, bull huss and conger eels. Flatfish, rockling and scorpion fish are also caught. Float fishing produces wrasse from the rough, along with mackerel, garfish and scad. Spinning or float fishing produces pollack and some coalfish. Some of these cliff marks require a drop net, otherwise you might lose larger fish. Be aware that some platforms seem to form a series of steps out to sea so rigs can get caught on underwater ledges. The lower rocks close in are covered with pea mussels, which explains why plaice are caught here, but this can shred line. An advantage of fishing the flood here is that as tide rises it makes it easier to land fish. You should avoid the rock platforms in stormy seas when the surf is pounding the rocks. Alan and John were soon fishing on a platform bearing the peg numbers 67- 70. 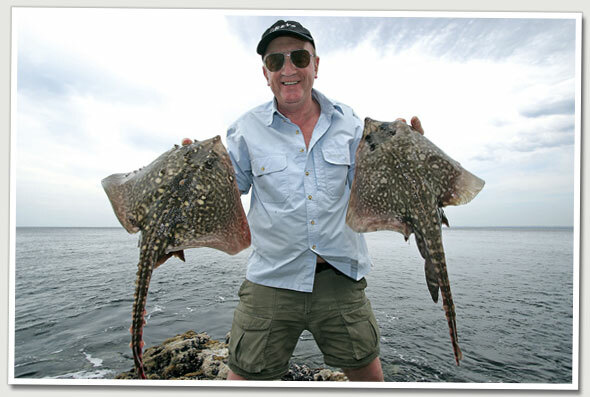 Alan fished two rods aimed at rays, congers and dogfish. One held 50lb mono line from a Shimano Torium 16 straight through to a plain lead weight with 20lb snood and size 6/0 hook carrying mackerel or squid baits for congers. The main rod was for those rays and he switched between a single hook paternoster rig with 30lb snood or a pulley with a 50lb hooklength. His ray bait was an Ammo frozen sandeel mounted on size 3/0 to 5/0 hooks. "Fishing for rays in deep water from a cliff over rock and kelp means it's important to get the fish up in the water before it gets to the kelp line, otherwise the fish will dive straight into it," advised Alan. "Trouble is your arm may be tiring when the fish gets close." It's a good reason to use a reel that casts long and retrieves fast - the ideal model is the Penn 525 Mag loaded with 0.38mm line. Alan's Penn reel was mounted on a Fox Rock Runner 5-6oz. After losing a first ray on a ridge, he switched to 50lb snoods and his next cast produced a 5lb thornback. Next to him, John also lost an early ray in the rough, then next cast got a 6lb 8oz ray. Then the inevitiable dogfish homed in on the sandeel baits. As the tide rose the sport improved and it was a fish every cast. There was hardly time to get two baits out before the next bite. Spotting another bite, Alan revealed: "A ray will flop on the bait to trap and eat it. This leads to a fairly small rod tip movement , but once the bait is taken the ray usually moves on giving some rod-lunging runs or a slack line. Don't strike too soon, wait for the run. 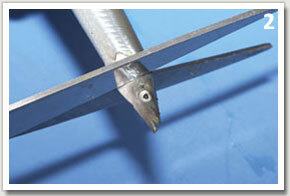 A ray can pull over the rod so it's a good idea to secure your rod-rest." A good retrieval method, used by the Kent duo on this type of ground, is to rest the rod on a tripod and wind very quickly. The height above the water helps the retrieve, as does a strong hook. Where rays need to be lifted direct from the water up a cliff face a long leader is essential. Get the leader on the reel before lifting. Best leader knot is the Bimini Twist. Tony used one rod baited with crabs and the other with sandeels. His paternoster rig carried a size 4/0 hook and rotten-bottom attachment. He favours Abu 7000s for rough ground and paired these with two Greys rods, a Platinum XS and a prototype heavy ground rod. Fishing at peg 49, the Geordie angler kicked off with the day's only blonde ray, following it up with 13 thornbacks and plenty of dogfish. He was the day's top rod. Alan bagged six more rays and lost several, besides catching dogfish and at high water a dab, while John added another four and also lost a few. Chris, who was using long rods (the Shakespeare K2 Team Xtreme Supreme and a Fox prototype) with Shakespeare Powerplay FD7000 fixedspool reels, caught four thornbacks, while Simon bagged two. Simon, who has owned Wessex Angling since 1991, incorporated a lead lift above his sinker to help raise his rig on the retrieve. The early June session had produced 31 rays to 8lb, not quite up to Alan's individual exploits two years earlier but fishing of a very high standard. Beware when unhooking the rays because they have strong jaws despite being toothless. Use a Gemini disgorger or forceps to remove hooks. Top bait for thornback rays from Ballyreen is a frozen sandeel. "Quality eels, like the red packet from Ammo, are essential," advised Alan. "Keep them in a flask or cool bag until used and they will keep fresh. 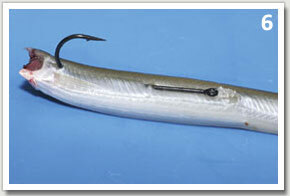 An eel with a burst belly does not catch as well as a solid bar of eel. "Rays are one of the few species that will regularly take a fresh dead sandeel. Surprisingly frozen eels catch much better than fresh, but dogfish are not so keen on a fresh sandeel so using them is a way to target the rays," he added. You need scissors for baiting a sandeel (1). 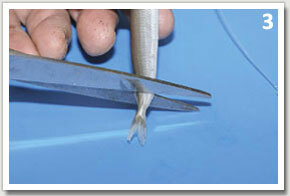 To bait a sandeel efficiently, cut off the head (2) and tail (3). Then thread the size 2/0 or 3/0 hook about one inch from the tail end (4). This allows more blood to flow from the area near the gills. Bring the hook out and reinsert one inch from the head end (5). This leaves the eye and knot of the hook exposed (6) and lashing cotton around this (7) secures the eel and prevents it slipping around the bend (8). 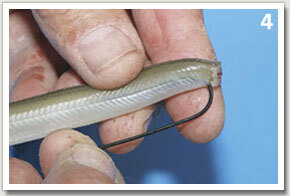 Tie your eels on with the lightest baiting elastic you can get. It makes a neat job and can be removed easily when you rebait. Frozen bait is sold in local tackle outlets, but live sandeels can be dug at low water from Fanore beach. Mackerel can be caught along the Clare coast from May until September.